Jailbreak for 1.1.3 is out for the iPhone (this doesn’t work on the iPod Touch yet…) and I will be live blogging my experience here at AppleiPhoneSchool.com. 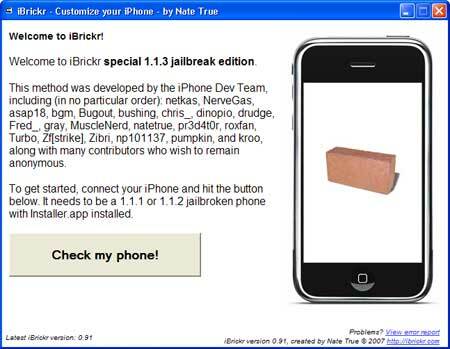 Once I have it figured out see our Mod/Hack page for steps to Jailbreaking 1.1.3! 6:22pm – PC Powers off during iTunes Download/Upgrade; restarting. 6:28pm – Syncing to iTunes 7.6 (just in case…) Brooke just reminded me to check if iTunes actually upgraded, it did not. Trying again. 7:54pm – Hi! This is Brooke…Doug’s backup is taking FOREVER…but, he insists on doing it correctly!! 8:08pm – Sorry, I’m almost done, gotta have my NES ROMs!!! 8:38pm – Backup done, here we go! 8:39pm – Opps, forgot, backing up SMS Messages using SMSD. Sidenote: I told Doug he was as slow as a turtle and he said…yeah, but the turtle won!! HAHA! :) Good story! 9:07pm – Everything is ready…this takes 1G of space and 300MB of free ram on your iPhone…Clicking, Do You Have to Ask? 9:13pm – Says…This will take a while. 9:35pm – iPhone is on…custom battery image has reset to stock, the custom slide to unlock text has reset, and custom carrier icon has reset. The Extended Preferences feature making the battery in the top right corner change to a percentage still works…not reset to stock. 9:38pm – The how to edit the home screen pop-up from Apple appears. All icons are stock. Dock is stock. Four icons now instead of the five I had when I began the process. The Dock.app is not there – though it was before I started. I’m getting emails like normal. Installer.app is there!!! So are all my sources! 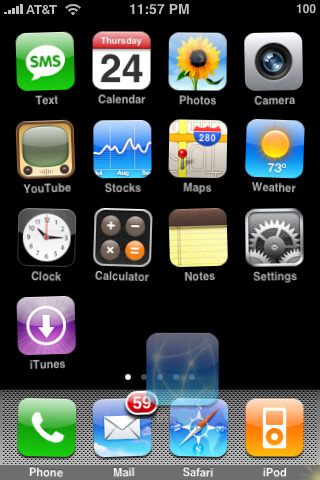 9:40pm – Testing wiggling icons…stayed tuned! 9:40pm – ICONS ARE WIGGLING!! Moving Installer.app to second page…worked! 9:41pm – We have heard that if you do not upgrade your Baseband Google location feature will not work…testing now. 9:42pm – Edge is NOT present…Google locate feature just spins, does not work. New feature…page peal works. 9:43pm – Although Edge icon isn’t present…Satellite view loads very fast…wifi is off. 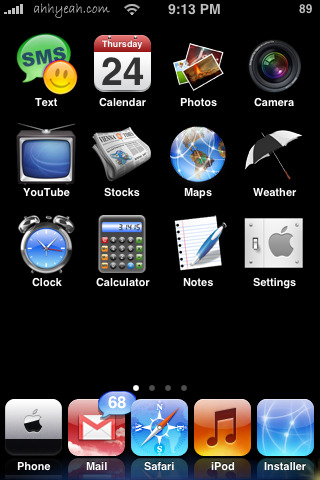 9:43pm – Test Messaging – all texts are still in iPhone but custom chat bubbles are gone. Notes – All previous notes are still there!! YAY! Settings – Contacts option has been removed from main menu…still available under Phone Setting. Edge must be working because there is send and receive data being shown. Under Phone Setting in AT&T Service option dialing codes for options now present ex) directory assistance – 411. Added International option under General Settings…though this was part of 1.1.2. The rest of the Settings are the same. 10:04pm – iTunes – New Redeemed button under downloads…for use of iTunes giftcards. Phone – All contacts, recent calls, favorites and voicemails stayed. Custom dialer did not stay. Safari – Instead of plus sign to the left of the address bar it is a magnifying glass which opens your search option. 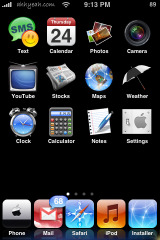 Plus sign (bookmarking ability) moved to the center of the bottom menu bar. 10:09pm – Testing Bookmarklet feature on Gizmodo.com. 10:19pm – All previously installed apps show up in the Uninstall option in the Installer.app but, do not show up on SpringBoard. Note: this is why we created a backup…all apps that we had on our iPhone that are no longer available in the Installer can be added via OpenSSH. 10:39pm – Attempting to Install TicTacToe…fresh install! 10:45pm – Just received long text message…now shows entire text message not just small portion and the options are close or reply instead of view or ignore. 10:57pm – Attempting reinstall of BSD Subsystems again… no effect on OpenSSH. 11:16pm – Ok, I think I got it (Thanks modmyifone.com) If you have MobileFinder, uninstall it and reinstall, otherwise install it. Use it and delete LocalPackages.plist in private/var/root/Library/Installer/ and Reinstall BSD subsystem, and OpenSSH. I am in progress of trying this…..
11:28pm – I renamed my LocalPackages.plist to LocalPackagesold.plist just incase I need it… Installer now shows nothing installed but Installer itself!!!! OK, now for BSD Subsystems… again… and then DOCK!!! I want a screenshot! 11:37pm – Reinstalled BSD Subsystems… again… Turned iPhone off and back on….installing openSSH. 11:48pm – I tried installing iSolitare from my backup by just dragging it into the Applications folder via SSH. Have to set the folder to permission 0755. Worked! 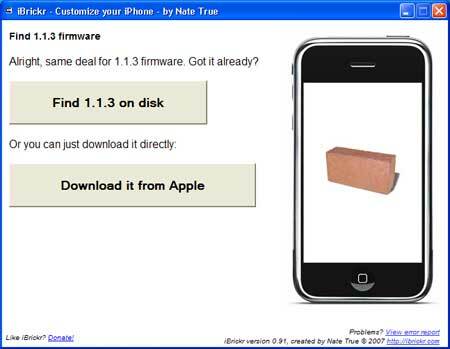 12:08pm – Installed an app called Baseband Info from Installer.app. My Baseband Modem Firmware is 04.01.13_G and my Bootloader Version is 3.9_M3S2. This is why my Google Locater feature doesn’t work… Anyone know how to upgrade? 12:33pm – NES works :) Goodnight! Im having a problem with my EDGE it says “could not activate EGDE your not subscribed to EDGE.” My safari was working fine untill i jaialbroke it to 1.1.3. does anyone have a solution for this? 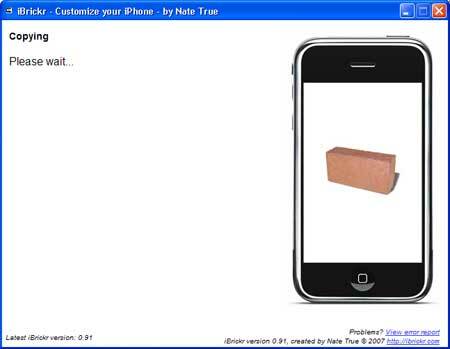 There’s a youtube video using the same special file from natetrue but using the ipod touch. It worked though. i reckon dont update is the smartest move, as so many error seems happen afterward. 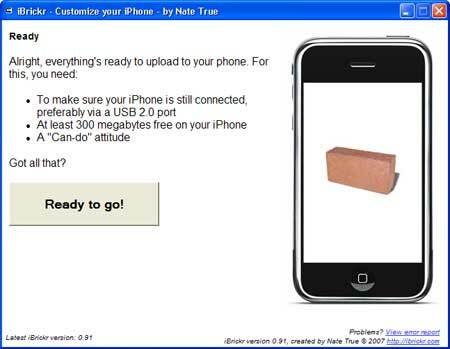 does anyone know if this works for the iPod nano yet??? I have the red one with the big screen if that makes any difference. I can’t wait!!! I’m with owen (comment #27) I’ve closed iBrickr and restarted my phone twice – then freshly opened iBrickr back up – but every time i hit check my phone it says its not jailbroken. 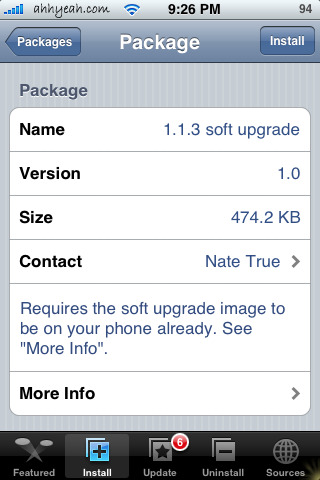 I’m on 1.1.1 (3A109a) as I have been since i broke it with jailbreakme.com. 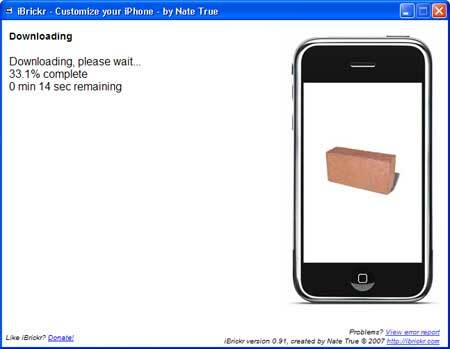 I saw a few people having this problem on modmyifone earlier… any fix known for sure yet??? i install 1.1.3 step by step it, i have installed 1.1.3 perfectly, but after a uninstall from a app is resetting my phone. and now cannot open . there is only apple logo on screen. I have try hard reset and i can shut it but it cant power on please help. So finally we have the new and “improved” 1.1.3! well there are alot of problems being reported and i dont think the dev team is currently working on anything since they have had this major breach in trust within crew members… i.e Nate! customise is coming out with a newer version for 1.1.3 and so is summerboard! all in all the upgrade to 1.1.3 is simple easy but i realy dont think its worth is sicne they will be realeasing the full version within weeks. Doug and Brooke, You guys rock..
also…after re-installing the BSD Subsystem, I un-installed and re-installed the Boss Tool and was able to move my wallpaper, ringtones and applications…freeing up space back to 53MB free now…because i was already getting out of disk space messages. So…this morning….I found that all my applications were still installed and the settings and contacts were back but none of the applications were listed in my un-install list in the installer. I don’t know what caused everything to come back…likely the Boss Tool shortcut thing to the other partition. I am now going to install what I can and un-install it until I get everything matched up on the install and un-install lists. Found a glitch….My Calendar and Maps are no long working….They launch and then close right back.